Despite 7,000 years history Damqan, a twonship of the province of Semnan in the north-east of the central plateau of Iran, has been forgotten beneath desert sand duns, whilst it is one of the most ancient urban metropolis in the Iranian plateau and hides many secrets covered by sands. Damqan is sitting still for many years like a seaport without shore at the skirts of the scorching desert and even refused to beg rain from heaven. With over 7,000 years history and a many historical monuments including Tappeh Hessar which belongs to the Mades, Parthians and Sassanid periods — the Tarikhaneh was built during the Sassanid period and beginning of Islam and many other historical buildings belonging to Seljuks and other periods — Damqan has witnessed many historical epoches. Tappeh Hessar with several layers of civilizations is hiding a long history in its bosom. Part of the layers in the Tappeh belong to the Mades dynasty which shared its civilization with Mesopotamia. Another layer covers the Achamanid, Parthian and Seleucid periods. 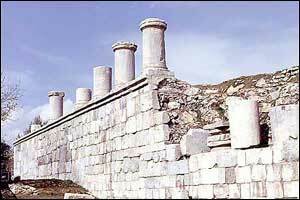 Tappeh Hessar achieved its peak of glory during the Seleucid and Parthian periods. During the reign of Tirdates 1 (Arcase II), Damqan was the capital of the Parthian Empire in Iran. With the discovery of relics from that period one comes across another layer which is ascribed to the Sassanians. Historical excavations has shown that the history of Damqan starts thousand years before the birth of Christ. For example Carbon 16 isotope inspections in Tappeh Hessar have revealed items belonging to 7,000 years ago. Recently expansion of Tehran-Mashhad railway into double lanes the body of a woman along with her fetus was discovered with over 7,000 years age. Kermanshah is situated in 47° 4´ east longitude and 34° 18´ north latitude located in the middle of the western part of Iran and is the center of Kermanshahan Province. As it is situated between two cold and warm regions enjoys a moderate climate. Kermanshah has a moderate and mountainous climate. It rains most in winter and is moderately warm in summer. The annual rainfall is 300-500 mm. The average temperature in the hottest months is above 22° C.
Because of the natural circumstances, this city is situated on the slopes of Koh-e Sefid, which is the most famous mountain in the suburb of Kemanshah. The length of this city is more than 10 km. Which runs alongside Sarab Rive and Valley. The height of Kermanshah city is 1420 m. above sea level. Kermanshah is one of the ancient cities of Iran and it is said that, “Tahmores Divband”, a mythical ruler of the Pishdadian had constructed it. Some attribute its constructions to Bahram of Sassanid dynasty, 4th century CE. During the reign of Qobad I and Anoushirvan Sassanid, Kermanshah was at the peak of its glory. And then became the secondary royal residence. Darius I the Great’s inscription at Bisotoun (6th century BCE): At a site some 1300 meter high in the mountains, one of the most famous sites in Near Eastern archeology has been attracting passersby since time Immemorial. It was, here that Sir Henry Rawlison copied the trilingual inscription of Darius I of Achaemenids, caved in 522 BCE. In old Persian, Elamite and Akkadian, an important step in the eventual decipherment of cuneiform in the mid 19th century. The Bisotoun relief above the inscription depicts Darius facing the nine rebel kings, whom the Achaemenid rulers uppercased when he came to power. Tagh-e Bostan, Sassanid Reliefs (224-651 BCE): The Sassanid kings chose a sensational setting for their rock reliefs Taghe-e-Bostan, four miles north-East of Kermanshah. A sacred spring gushes forth from a mountain cliff and empties into a large reflecting pool. In writer the entire scene is shrouded in mist and clouds. One of the most impressive reliefs, inside the largest grotto or “ivan” is the gigantic equestrian of Sassanid king, Khosrow II (591-628 CE) mounted on his favorite charger, Shabdiz. Both horse and rider are arrayed in full battle armor. There are two hunting scenes on opposite side of the ivan, one depicts the imperial boar hunt and the other in a similar spirit shows the king stalking deer. Elephants flush out the feeling boar from a marshy lake for the king who stands poised with bow and arrow in hand serenaded by female musicians following in other boats. These royal hunting scenes are among the most vivid of all rock reliefs, true narrative murals in stone, Jumping 1300 years in time the upper relief shows the 19th century Qajar king Fath-Ali shah holding court. Kurds form the majority of population of Kermanshah. It has a population of 822,435 (2001 estimate). Tehran Bozorg (Greater Tehran), the capital of the Islamic Republic of Iran and center of Tehran Province as well. Tehran is one of the largest metropolitans of the world, and it is the country’s largest economic center and the base for its large and small modern technological and industrial establishments. Located on the slopes of the mountains and at the foot of the magnificent Mount Damavand, it has been the country’s capital city for over 200 years now. Nearly 14 Million people live in Tehran in contrast to two hundred thousand in 1920. By the Mongols’ invasion and the consequent severe devastation the city of Rey received, most of the Rey’s people took refuge to this village. At the time of the Zand dynasty, it was a small town that was significant from a military point of view. The first of the Qajar kings, Agha Mohammed Khan, named Tehran as the country’s capital in 1778. Nevertheless, the capital’s development started at the time of another Qajar monarch, Fath-Ali Shah. The citadel, which Agha Mohammed Khan had built, was developed to include the new royal buildings. At the same time, the city’s population was redoubled. With the increasing importance of the city, soon gates, squares and mosques were built and it was at the time of Nassereddin Shah that the city’s master plan was prepared and modern streets were formed. Later, large central squares like Toopkhaneh (now Imam Khomeini) square and several military buildings were constructed. With the decline of the Qajar dynasty, Tehran soon took the shape of a modern city. The construction of large government buildings, new streets, recreation centers, urban service establishments, and academic and scientific centers were started, while most of the old gates and buildings were destroyed and the city’s old architectural fabric replaced by a modern one. Dams of Karaj, Latian and Lar supply Tehran’s drinking water and parts of the country’s electrical power. These dam-lakes and river-sides provide also valuable tourism sites for visiting and enjoying walking and viewing beautiful natural sites as well as practicing various kinds of sports, including water sports. There are dozen of small coffee-houses with zinc roofs nestle among the bushes. Mountain streams run among the tables. But everyone does not sit around a table; many of the customers prefer the ancient-style comfort of low divans covered with old carpets. Delicious “kababs” are consumed, and hot teas are served from “Samawar”. The Golestan (Rose Garden) Palace is one of most visited places in Tehran, which was the Qajars’ royal residence. Its garden is an oasis of coolness and silence in the heart of the city. 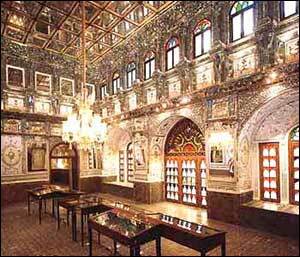 The main building, architecturally unpretentious, houses a museum with objects from the Qajar period in the overloaded and pompous style of last century. 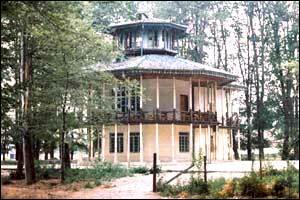 In the Golestan garden, a one-story pavilion to the right and slightly behind the entrance, shelters one of the best organized museums in Tehran. It contains about thirty showcases presenting everything, which makes up the basic originality of Iranian life in the various provinces of the country. Zahedan, city in southeastern Iran, located near the borders with Pakistan and Afghanistan, the capital of Sistan and Baluchistan province at altitude of 1,352 m from sea level at a distance of 1,605 km from Tehran. Lying east of the “Kavir-e Loot” desert, Zahedan used to be called “Dozdab”, as it was the meeting place of bandits. “Dozd” means robbers and bandits. “Ab” means water or a place of water. Bandits used to frequent the place for their drinking water. Zahedan is the main economic center of the region and home to many small- and medium-scale industries. Its main products include cotton textiles, woven and hand-knotted rugs, ceramics, processed foods, livestock feed, processed hides, milled rice, bricks, and reed mats and baskets. Highways link Zahedan to Tehran and Mashhad in the north, the port of Bandar Chabahar on the Arabian Sea in the south, and the Pakistani city of Quetta in the east. A rail line also runs from Zahedan to Quetta, and a rail line from Zahedan to Kerman in central Iran was being constructed in the mid-1990s. Zahedan is also served by an international airport. Like most Iranian cities, Zahedan has a Friday mosque, “Jame mosque”, where many members of the community gather to worship on Friday. It also has a Sunni Mosque, “Makki Mosque”, which is the greatest mosque of Sunnites in Iran with stuccos and decorations in Indian architecture method, a Sikh temple, and ruins of an old fortress. A colorful bazaar, “Rasouli Bazaar”, patronized by the local Baluchi tribes can also be found in the city. About 100 km south of Zahedan is an intermittently active volcano, “Taftan”, which rises abruptly 4,042 m from the surrounding plain. 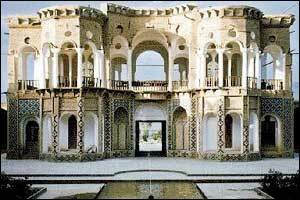 Although the surrounding area has some ancient sites, Zahedan has developed only in the 20th century. Before being chosen as the provincial administrative center in the 1930s, Zahedan was a small village. Its population reached 17,500 by 1956 and increased more than fivefold to 93,000 by 1976. After 1980 large numbers of refugees fleeing the invasion of Afghanistan by the Union of Soviet Socialist Republics (USSR) helped to triple the population of Zahedan to more than 281,000 by 1986, and now It has a population of 590,125 (2001 estimate). Kashan flourished during the Sassanid dynasty; but, it was demolished during the Arab invasion with the exception of a few ancient buildings remaining. Kashan became prosperous again during Seljuq times and is known for its ceramics since then. Kashan once again was destroyed during Mongols invasion but it became an important town in the Safavid periods, and was the capital during the reign of Shah Abbas Safavid II. Some Safavid rulers preferred to live in Kashan rather than in the capital, Esfahan. A local historian wrote that Kashan’s name is derived from “Key Ashian” which means place of rulers. This mosque and theological school (Madreseh Agha Bozorg) is located in the center of Kashan. The mosque consisted of two large “eivan”, one in front of the “mehrab” and the other by the entrance. The courtyard has a second court in the middle which comprised of a garden with trees and a fountain. Surrounding the courtyard are arcades. The eivan in front of mehrab has two minarets with a brick dome. The colors of arcades and eivan are restricted to blue, red, or yellow against a brick ground. This is used to be a private home but now is open to public as a museum. This house was built in the early 19th century and consisted of a beautiful courtyard, delightful wall paintings and very unusual wind towers which helps cool the house. Friday Mosque or Masjed-e Jomeh with its 11th century “mehrab” was built during Seljuq period and has been restored several times since then. This mosque also dates back to Timurid Dynasty (15th century) and has a minaret with some ancient inscriptions. The richest archaeological site in central Iran is the mound of the Tappeh-ye Sialk. This site was excavated by Ghirshman in the 1930s. The excavations revealed that the site is more than 7000 years old. Sialk was occupied from the fourth millennium BCE until the 8th century BCE. Probably, one of the most interesting findings are inscribed clay tablets dating back to the late 3rd and early 2nd millennium BCE. There are also some records showing immigrants and conquerors passing through this region and settling near Bagh-e Fin. 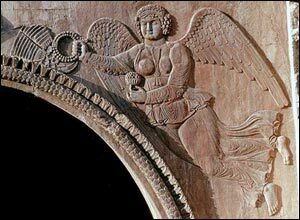 The artifacts uncovered reside in the Louvre Museum in Paris and the archaeological museum in Tehran. There is not much to do or see there today unless you are an archaeologist. Rasht, the capital city of Gilan province, is one the most important cities of this region. This city is situated in a vast plain at a distance of 30 km from the Caspian Sea in the slopes of the northern Alborz Mountain Range. The climate of Rasht is humid and unstable. Dominant wind currents from the Caspian Sea blow northeast to southwest, and annual precipitation is relatively high. The history of Rasht dates back to the pre Islamic period i.e. the Sassanid era. The independent governors of this region were called “Gilanshah” before the Arabs ínvasion. In the year 682 CE, after the conquest of Iran by Arabs, the name of Rasht was mentioned in historical documents for the first time. In the Safavid era, especially in the reign of Shah Ismail, Gilan land was composed of two sections of “Biehpas” with the centrality of Rasht, and “Biehpish” with the centrality of Lahijan . During the reign of Shah Tahmaseb I, the governance of both parts was assigned to “Khan Ahmad Gilan”. 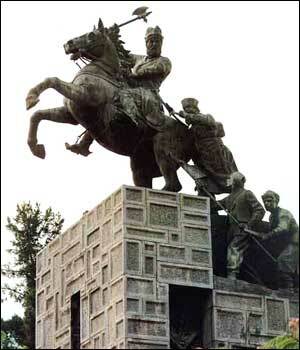 Finally, Shah Abbas I conquered Gilan. In the year 1695 CE, Stephan Razin, a Russian sailor plundered the city. The army of Peter the Great conquered the city in 1722 CE. And they remained in the region till 1734 CE. The Russians again conquered this city in 1917 simultaneous with the Socialistic Revolution in Russia. In 1901 due to outbreak of epidemic plague, many people lost their lives. In 1937, an expanded revolt happened in the region to get “road tax” from Russians, but the central government suppressed the movement. The people of Rash played a very important role in the Constitutional Revolution. Russian and British army as well as local rebels attacked Rasht City during the World War I (1914-1918). In 1920, Rasht became the arena of revolutionary movements again. When the Red Army conquered Baku in 1918, the navy of White Army took asylum in the Anzali Port, which was under control of British army. The commander of the Red Navy chased them and conquered the Anzali Port and as the result the British Army retreated. This event encouraged revolutionaries of Gilan to establish an anti-British government under the leadership of “Mirza Kouchek Khan-e Jangali”. British forces evacuated the city and went to Baghdad. Finally, Iranian army defeated the movement and a treaty was signed with Russia after which they evacuated the city. Today, Rasht as the capital of province is the most important trade center between Caucasia, Russia, and Iran and holds considerable tourism facilities. This thousand-year-old village resembles an anthropological and architectural museum, which is located 60 km southwest of Rasht and 25km west of Fooman in the western most part of Gilan Province. Even though Masouleh is close to the Caspian Sea, but it is 1,050 meters above sea level. The difference between the highest and lowest points in the village itself is 100 meters. The history of Masouleh dates back to 10th century CE and in past times the village was also known as “Maasalar” and “Khortab”. The architectural style of the homes in Masouleh is stair shaped and is remarkable. They are continuous and uninterrupted and have been built in the heart of the mountain. A very interesting point about the homes in Masouleh is that courtyards and roofs are basically meaningless and do not serve their traditional roles and instead serve as pedestrian areas for passersby just like a street would. 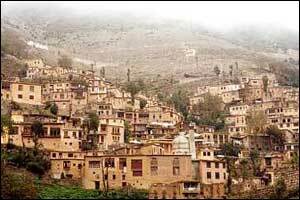 Masouleh is the only village in Iran, which forbids all motor vehicles from entering it. The yellow-clay is the predominant external facade of most of the structures in Masouleh, which serves for better visibility in fog. The 3000-meter long mountains surrounding Masouleh are under the cloud of fog very often. Masouleh has a population of almost 800. Shahr-e Ray, the 5000-year-old city, is a residential area in the south Tehran. It is richer than many other ancient cities in the number of its historical monuments, among which one might refer to the 3000-year-old Gebri castle, the 5000-year-old Cheshmeh Ali hill, the 1000-year-old Bibi Shahr Banoo tomb and Shah Abbasi caravansary. Ray is a great museum, which is covered with ancient monuments and sites, so that visiting Ray means stepping into the history. Its name dates back to the pre-Median era an used to be called “Rhagae“. Some historians attribute its building to ancient mythological monarchs, and some others believe that Ray was the seat of a dynasty of Zoroastrian leader. In the past 4000 years Ray has gone through many ups and downs, floods and earthquakes. Ray proudly sourvived massive and destructive Arab and Mongolian invasions and plunderings, which left serious scars on its body. Ray was erected in glory much earlier than the modern city of Tehran, which was later constructed on its north. Tehran, whose definite date of construction is unknown, has just overshadowed Ray due to the extension of modernism and today’s signs of civilization. in the course of history books and publications were pointing to Ray, but in the contemporary era the lack of references and information on this ancient historical and religious city is quite evident. It is a hill with a spring. Once the ancient cavemen stopped living in caves, they settled at the banks of the hill. In 1933-6 Cheshmeh Ali hill was excavated by archaeologists from the Boston Fine Arts Museum and the Philadelphia University Cultural Foundation headed by Dr. Smith, which resulted in the discovery of 7,000-year-old artifacts. Some of the discovered objects are displayed at museums in Iran and abroad. The hill, which is now entirely leveled out, was resided by Aryans about 6,000 years ago. Since Ray was used as a recreation center due to its beautiful attractions under the reign of the Qajar dynasty, Fath-Ali Shah often used to explore the city. In 1831 his portrait and that of some Qajar princes were engraved on a rock at Cheshmeh Ali hill and its surrounding was decorated with tablets covered by poetry. The architectural structure was constructed under the reign of Saljuks at the order of Toghrol in 1140, once he transferred the capital city from Neyshabour to Ray. The tower is 20 meters high and the surface of its exterior is divided into 24 sections, which besides manifesting beauty and durability, symbolizes the figures of constellation as well as a 24-hour time length (a day and a night). It is one of the ancient residential and commercial complexes, which was used as a lodging by traders and located on the shrine Street, close to the Bazaar. It is comprised of four verandas and is surrounded by stones all around, which used to serve as a market place where goods and commercial products were presented and sold by traders. It is located to the north of Abdol-Azim’s shrine, which is comprised of two sections and a crossroad is formed at their intersection. Since old days, it has been a center for the sale of spices, traditional herbs and commercial goods which were imported by traders via the Silk Road. The structure of the bazaar is constructed from plaster, brick, raw mud brick and mud. It dates back to the Safavid era and is approximately 500 years old. An octagonal tower known as Naqareh Khaneh stands on the slopes of Tabarak mountain. A cellar is linked to the tower from underneath though a vestibule erected outside. The tower, which is constructed by stone and plaster and decorated by brickwork and zigzag vaults, dates back to the Saljuk era. The area has been resided by Zoroastrians, who used to leave the corpses of the dead in the open air. According to their traditions, once their flashes were decayed, the remaining bones were eventually buried. The ancient Zoroastrians disapproved of contaminating the body with water, earth and fire. Gebri crypt was built as a high circular structure, six meters high, which was constructed by stone and mortar. It dates back to the 1st millennium BCE, around 3,000 years ago and was earlier called by different names, such as Khamoushan tower, Ostvaran, Ostkhan-ran, Marg (Death) tower and Sokout (Silence) tower. 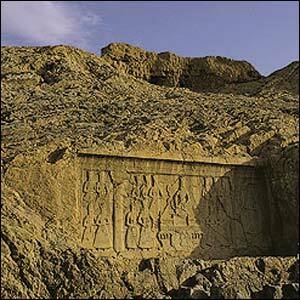 The tomb, which is measuring 1.5 km, is located to the north of Amin-abad on the mountain rocks. It is attributed to the daughter of Yazd Gerd III, the last Sassanid monarch, and Imam Hussein’s (third Shia Imam) wife and the mother of the 4th Imam. It is comprised of two courtyards, the entrance veranda, a praying niche and a waterwell. It is bordered by a mountain to the north, a valley to the east and south and an asphalt road to the west. Its structure, which is constructed by stone and plaster, dates back to the Al-e Bouyeh era, around 1,100 years ago. At the order of Fath-Ali Shah Qajar, a slide was erected on the Ashkan mountain as a sliding and recreation tool for the monarchic family. At the southern slopes of the mountain, a rough image of the Sassanid kings has been carved on a rock, which was leveled to this purpose. The image is left incomplete. Later at the order of Fath-Ali Shah the image was erased to be replaced by his won portrait, while he had a crown on head and a spear in hand targeted at a lion. Abdol-Azim a grandson of Imam Hassan (second Shia Imam), is believed to be a scientists and narrators, who has left behind a number of books. The most ancient structure of the mausoleum is its brick facade, which is marked by its brickwork decoration and marginal Kufi scripts, dating back to the Saljuk era, around 800 years ago. The mausoleum of Hazrat Abdol-Azim and its adjacent shrines (Imam-zadeh Taher and Imam-zadeh Hamzeh) is visited daily by enthusiastic pilgrims who arrive in Ray. Beside the historical monuments in Shahr-e Ray, there are more than 25 tombs of religious leaders and prominent individuals such as Ali Akbar Dehkhoda, Jalal Al Ahmad, Gholam Reza Takhti, Qa’ani, Mirzadeh Eshqi, Sattar Khan, Ayatollah Kashani, Allameh Qazvini, Qa’em Maqam Farahani and Sheikh Saddouq, who are among the Iranian scientific, cultural,religious, national and political personalities, whom are mostly buried at Ibn-e Babveyh graveyard. The number of ancient historical monuments at Ray far exceed that of other cities and most of those buildings belong to the pre-Islamic era. But unfortunately, they are on the brink of extinction due to lack of attention, found and proper restoration plans. Kerman city with a height of 1755 m. is located on a high margin of Kavir-e lut (Lut Desert) in the central south of Iran, is the Capital of Kerman Providence. Kerman is counted as one of the oldest cities and its name is derived from the Germaniol race listed by Herodotus, and its construction is attributed to Ardashir I of Sassanid Dynasty (Ardashir-e Babakan) in 3rd century CE. Kerman was ruled by Turkmans, Arabs and Mongols after the 7th Century CE and was expanded rapidly during the Safavid Dynasty. Carpets and rugs were exported to England and Germany during this period. As it also is a major hand woven carpet production center of the country, and hundreds of small workshops scattered through the city. Kerman has had a long turbulent history. It was only during the rule of the Qajar Dynasty that security was restored in this city under the Central Government. Kerman has a small Zoroastrian minority. Most of the ancient Kerman was destroyed in a 1794 earthquake. The distance between this city and Tehran is 1064 kms. and is on Tehran, Bandar Abbas and Zahedan route. Kerman airport is counted as one of the main airports which has daily & weekly flights to Tehran, Ahwaz, Yazd, Esfahan, Bandar Abbas, Mashhad and Shiraz. Also the Trans Iranian Railway passes through this city. 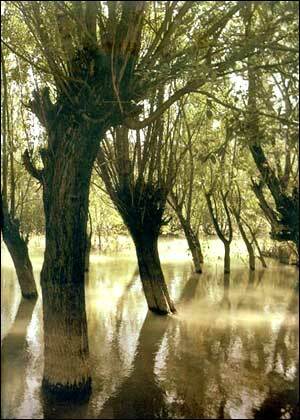 Kerman city has a moderate and the average annual rainfall is 135 mm. Because it is located close to the Kavir-e lut, Kerman has hot summers and in the spring it often has violent sand storms. Otherwise, its climate is relatively cool. Masjed-e Jame or Muzaffari is one of the historical monuments of the 14th century CE, famous for its magnificent portal, its mihrab and mosaic-tile decorations, and its historic inscription, which bears the date 1349 CE. On the western side of the mosque, there is an ivan which originally dates from the times of Ali Muzaffar. It has a wonderful blue faience featuring shades of blue from turquoise to ultramarine, creating a vertical horizon of smooth shimmering tiles. However, the mosque has been repaired in later periods, including repairs of the main part of its mihrab, carried out in the reign of Shah Abbas II of Safavid Dynasty. The wall of the Mihrab (altar) and the central dome are also decorated with admirable geometric compositions. The altar is open to the public. The south-western portal of the mosque also belongs to the Safavid period. The minaret and the Muadhin`s cage of the Masjid have been repaired under Karim Khan of Zand Dynasty, and its mihrab is one of the outstanding parts of this monument. Some essential repairs and decorative and tile works were completed in the year 1940. It is considered to be the most fabulous structure in the city and is located in the main square of “Shohada”. Ganjali Khan was one of the famous rulers during the reign of Shah Abbas of Safavid. 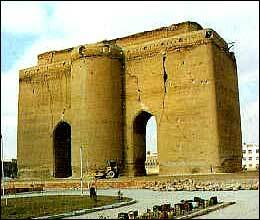 As the ruler of Kerman province he constructed many monuments and buildings. Ganjali Khan complex is composed of a school, a square, a caravanserai, a public bath, a water reservoir, a mint house, a mosque and a bazaar. A number of inscriptions laid inside the complex indicate the exact date when these places have been built. 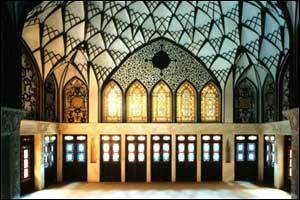 Out of Ganjali Khan complex, the Khan public bath located in the grand bazaar of Kerman serves as an anthropology museum today and attracts an increasing number of Iranian and foreign tourists. This is a unique work of architecture with beautiful tile works, paintings, stuccos, and arches. The bath rendered service no later than 60 years ago. In the closet section and main yard of the bath there are many life-like statues. These statues were designed at Tehran University’s faculty of fine arts in 1973 and then transferred to this museum. This complex has been built during the Safavid era (1501 – 1722 CE) enjoying a modern architectural style of the time. This bath is an association of architecture and application of an array of constructional materials in an appropriate space with totally popular approaches. 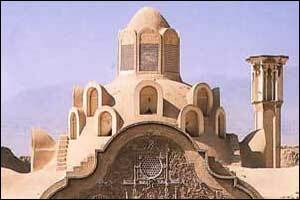 The architect of the bath and the complex is a master from Yazd city named Mohammad Sultani. 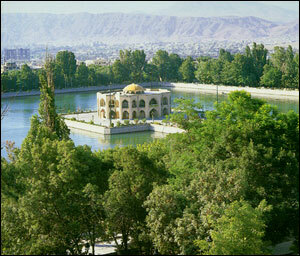 Tabriz is the capital of one of the most famous provinces of Iran, The Azarbaijan or Aturpatgan. It is the land of Azargoshnasp temple; The fire temple of the Kings and the Nobles of Iran. It is perhaps the birth place of Zaratushtra. Tabriz, Being the provincial capital of East Azarbaijan ( Aturpatgan ), has slightly more than 1,700,000 population and was the second largest city in Iran until the early 1970’s. Tabriz has been the capital city of Iran on numerous times throughout the old history of this country. Tabriz is located in a valley to the north of the beautiful Mount Sahand. The valley opens out into a plain that slopes down gently to the northern end of Lake Orumieh, about 60 km to the west. Tabriz is 310 km southeast of Bazargan (Iranian-Turkish frontier); 159 km south of Jolfa on Iran- Aran (Azarbaijan Republic) border, and can be reached by very good roads, rail (742km from Tehran, with connections to the Europe and Moscow), and air from Tehran and other major cities. The city has a long and turbulent history although the early history of Tabriz is shrouded in legend and mystery, the town’s origin is believed to date back to distant antiquity, perhaps even before the Sassanian era (224 – 651 A.D.). 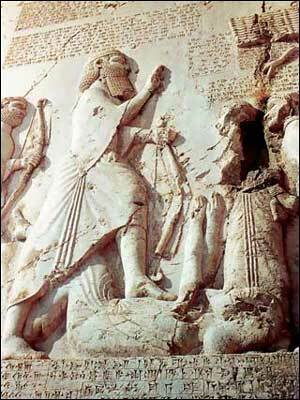 The oldest stone tablet with a reference to Tabriz is that of Sargon the second, the Assyrian King. The tablet refers to a place called Tauri Castle and Tarmkis. The historians believe this castle was situated on the site of the present day Tabriz. It was the capital of Azarbaijan in the 3rd century A.D. and again under the Mongol Ilkhanid dynasty (1256 – 1353), although for some time Maragheh supplanted it. During the reign of Aqa Khan of the Ilkhanids, as well as under the reign of Ghazan Khan, Tabriz reached the peak of glory and importance. 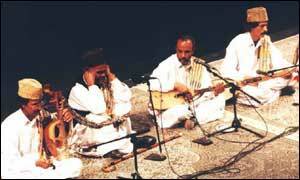 Many great artists and philosophers from all over the world traveled to Tabriz. In 1392, after the end of Mongol rule, the town was sacked by Tamerlane. It was soon restored under the Turkman tribe of the Qara Qoyunlu, who established a short-lived local dynasty. Under the Safavids it rose from regional to national capital for a short period, but the second of the Safavid kings, Shah Tahmasb, moved the capital to Qazvin because of the vulnerability of Tabriz to Ottoman attacks. The town then went into a period of decline, fought over by the Iranians, Ottomans and Russians and struck by earthquake. Tabriz was the residence of the crown prince under the Qajar kings, but the town did not return to prosperity until the second half of the 19th century. The greatest boost to Tabriz came with the opening up of Iran to the West at the turn of this century, when it became the main staging post between the interior of Iran and the Black Sea and,for a short time, the economic capital. In 1908 it was the center of a revolt against Mohammad Ali Shah, which was only put down with the brutal intervention of the Russians. In the second Irano-Russian War the city was occupied by the Czar troops. However, it was returned to Iran following the signing of Turkmanchai Treaty, a peace and trade settlement that ended the Irano-Russian War of 1826-1828. The Iranian Constitutional Revolution originated in Tabriz and culminated during the reign of Mohammad Ali Shah of Qajar dynasty (1779-1925). Sattar Khan and Baqer Khan were the two most prominent leading figures behind the movement. Tabriz was occupied by Russians several times in the first half of 20th century, including most of both world wars. A railway line to the border at Jolfa, built by the expansionist Russians, was of little importance until recently, but it has increased in significance in the ’90s as a result of Iran’s friendlier relations with its northern neighbors. With a very rich history, Tabriz used to house many historical monuments. Unfortunately, many of them were destroyed in repeated invasions and attacks of foreign forces, negligence of the ruling governments, as well natural disasters such as earthquakes and floods. What remains now mostly dates back to the Ilkhanids, the Safavids, and the Qajars. Some of the monuments are unrivaled masterpieces of architecture. There are many factories and great industrial and productive sites in Tabriz which have changed it into one of the industrial centers in the country. The most important factories are as follows: Tractor, machinery and ball-bearing manufacturing factories, refinery and so many other centers such as carpet weaving sites. Ark-e Tabriz in Persian (also called Masjid-e Alishah, Arg-e Alishah) is the impressive remainder of a great and imposing building in the town. The Arg, a huge and crumbling brick citadel, is a notable landmark that was built in the early 14th century on the site of a massive mosque which collapsed over 500 years ago, and which must been one of the largest ever constructed. Inside the Citadel there is nothing except two arches and an indication of the position of the mehrab; Ali Shah’s court has been covered with ignoble buildings, the sanctuary walls have been rebuilt and propped up, and it is hard to believe that any part of this place was ever a mosque. The Constitution House is located next to the Tabriz grand bazaar, on Motahari Ave. During the years which led to the Constitutional Revolution and afterwards, the house was used as the gathering place of the leaders, activists, and the sympathizers of the movement, among them Sattar Khan, Baqer Khan, Seqatoleslam and Haji Mirza Aqa Farshi. 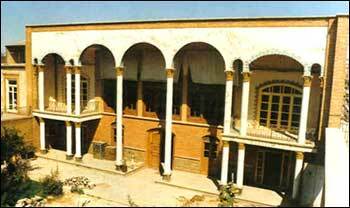 The two-story building was constructed in 1868 by Haj Vali Me’mar-e Tabrizi. It has numerous rooms and halls. The most beautiful part of the house is a skylight and a corridor decorated with colorful glasses and mirrors. The Blue Mosque (or Masjid-e Kaboud) on the north side of town, is a 15th-century structure destroyed partially by one of Tabriz’s recurrent earthquakes. The entrance portal with its two minarets appears to have been connected with the main prayer hall (Shabestan) under the largest cupola of the mosque, by means of vaulted corridor. On both sides along the corridor, there stand the remains of the chambers with vaulted roofs. The walls of the mosque have been riveted with marble slabs and decorated with superb mosaic tiles. Some of the blue mosaics in the mosque’s portal are heavily damaged and half missing. Do not miss El Goli (former Shah Goli), a pleasant hillside garden and park around an artificial lake to the area of 54,675 square meters. El Goli, only 4 km south of downstream Tabriz, is so lovely a place that it deserves an illustration. It is a popular weekend resort for the locals. A hill in the eastern side of the park leads down to the pool with steps, and a fountain from top of the hill flows down to the pool. In the center of the pool there is a grand hexagonal building. The pool itself is said to have been built during the reign of Aq Qoyunlu kings. However, it was extended by the Safavids. Strolling in the center of Tabriz, one is reminded very forcibly that it is a commercial city: one cannot miss its very large and 15th-century covered bazaar. It is already much diminished in its variety of goods, but still a great place for getting hopelessly lost amid its dusty architectural splendors. Its architectural style, numerous caravansaries, mosques, and schools have added further beauty and glory to this complex. Exact information on the history and origin of the bazaar is not available; however, historical buildings such as the Jam’s Mosque, Talebieh School, and Sadeqieh School indicate that the complex is one of the oldest structures of the city. 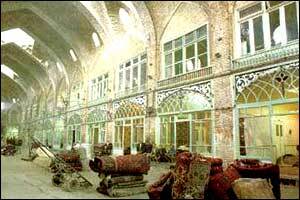 The present structure of bazaar dates back to the closing years of the Zand dynasty (1750-1779 A.D.). From the earliest days of Christianity there has been a sizable Armenian community in Tabriz, and the city boasts a number of churches, including one mentioned by Marco Polo on his travels. Nowadays, Tabriz has six churches, the most important of which are: Saint Serkis Church, located in Armenian quarter of Tabriz, Baron Avak, which was renovated in 1845; probably the most interesting and the oldest but substantially rebuilt Church of St. Mary (Kelesa-ye Maryam-e Moghaddas) which was completed in 1785, on the corner of North Shari-ati Ave. and Jomhuri Ave; Able Mary Church which was built in 1910 and is on Miar Miar quarter of Tabriz. Mashhad, Iran’s holiest city, is the capital of “Razavi Khorasan” province or former province of Khorasan which in 2004 was divided in to three provinces of “North Korasan”, “Razavi Khorasan” and “South Khorasan”. 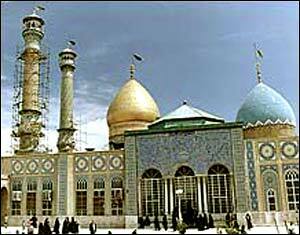 Mashhad is located 850 kilometers North East of Tehran and has population of over 2 million. The name means the burial place of a martyr. Back in the 9th century A.D., Imam Reza was poisoned and martyred in the city. He was the eighth Imam (head spiritual leader) of Shi’ate Islam. His holy position made his tomb a sacred place for pilgrims to worship. Millions of people pay pilgrimage to the holy shrine, undoubtedly the largest and most magnificent of its kind, every year. There are plenty of priceless objects and unique manuscripts in the shrine’s library. Mashhad is a tourist city with many hotels of various categories as well as a great number of guesthouses for the pilgrims who come to this city from the other parts of the country everyday by tens of flights, trains and buses. Before he died, the city was known as Sanabad, a small village in the north of Persia. After his death, pilgrims came and ended up staying in Mashhad. The village grew into a small city because of his shrine. Sunni Muslim forces sacked the city, followed by the Mongols in the 13th century. The shrine was badly damaged and, after time, rebuilt. In the 16th century, three Safavid Dynasty rulers established Shi’ite Islam for the whole territory. The shrine was restored and enlarged. These rulers made pilgrimages to the site and since then it has become the most holy Shi’ite pilgrimage in Iran. The mosque and ivan of Gowhar Shad rank among the most beautiful historic structures of the 15th century A.D. Iran. 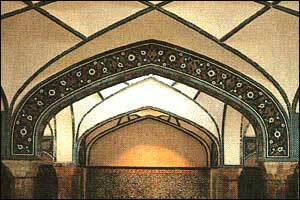 The founder of the mosque is Gowhar Shad, wife of the Taimurid Shahrokh. It is a four-ivan Masjid with two tile-decorated minarets flanking its main ivan. Upon the front of the ivan, there is a stately inscription containing the name of Shahrokh Bahadur and the date 1418 A.D. A part of the inscription is by the Taimurid prince, Bysonghor Mirza and is exceedingly remarkable as a calligraphic achievement. The rest is from the Safavid period and has been attributed to Mohammed Reza Imami. The Gowhar Shad structures are masterpieces of archeological skill and tile decoration. The city’s climatic condition is varied with very cold winters, pleasant springs, usually mild summers and beautiful autumns. The magnificent holy shrine of Imam Reza and the historical and artistic complex attached to it including the courtyards, porticos and porches, the Goharshad Mosque (of Timurid period) as well as its rich museum and library are the most significant sights to be seen by any visitor and pilgrim. There is a magnificent golden dome over the shrine’s building; surrounded by several porches. The Grand Gohaharshad Mosque is located to the south of the shrine, the museum and the tomb of Sheikh Bahaee to the southeast and Parizad and Balasar Schools to the west. Other than a number of large beautiful parks, the other sights tomb of Nader Shah of Afsharid Dynasty, Kooh Sangi pool. There are also some sights outside the city. Tomb of Khajeh Morad kilometers from Mashhad along the road to Tehran, the tomb of Khajeh Rabi’ located 6 kilometers north of the city where there are some inscriptions by the renowned Safavid calligrapher Reza Abbasi, and the tomb of Khajeh Abasalt in a distance of 20 kilometers from Mashhad along the road to Neishabour, (the three personalities were the disciples of Imam Reza). Among the other sights are the tomb of the great poet Ferdowsi in Tous, 24 kilometers away from Mashhad; and the summer resorts at Torghabeh, Torogh, Akhlomod, Zoshk and Shandiz.